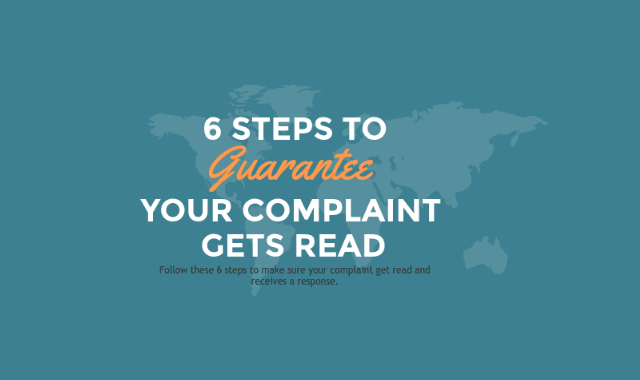 Get Your Complaint Read (In 6 Easy Steps) #Infographic ~ Visualistan '+g+"
Have you had a bad experience with a company's product or service? If so, you've probably experienced the frustration of trying to contact them by phone, email or social media. Companies are making it difficult or in some cases impossible to contact a human being. Phone numbers are an endless series of button pressing with no one but a computer on the other line. Email addresses and contact forms are hidden on websites or removed altogether. Social media accounts are automated or don't exist. If you do manage to get through, the representative often speak poor English or can not do anything to address your issue. Email responses are often canned "Thank you for your feedback" templates and no additional follow up is ever sent. Other contact information is vague (PO Box) or isn't published online. Basically, every action is taken with the goal of removing human interaction. We think this trend is frightening! How can a business improve if it doesn't listen to the customers who are willing to use their hard earned money to buy it's products and services? In response, we've put together this simple to follow 6 step guide to make sure your complaint is read and receives a response!